Best Reads of 2017 | Dr. Z. Just in case you’re seeking the perfect Christmas gift for your favorite bibliophile, I have a few suggestions. After reading about 90 books thus far in 2017, these are the ones I’ve found the most interesting and delightful. Matthew Barrett. God’s Word Alone: The Authority of Scripture. This year I went through a bunch of books on the Doctrine of Scripture for a class I was teaching, and Matt Barrett’s was easily my favorite. This is a fresh, alive, and clear defense of the inspiration, inerrancy, and authority of Scripture with reference to history and in application to our contemporary context. Read it! Mike Fabarez. 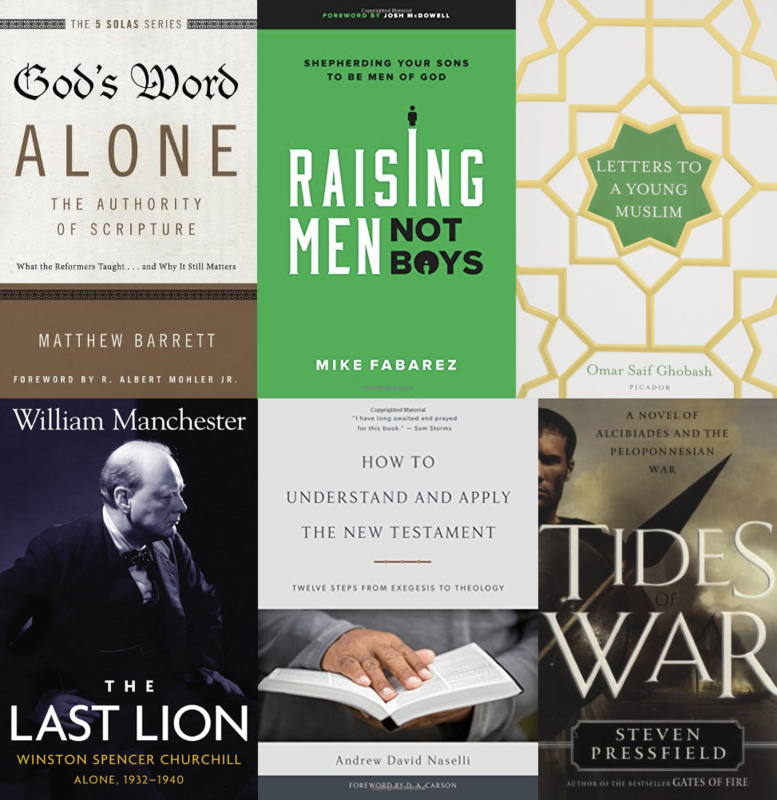 Raising Men, Not Boys: Shepherding Your Sons to be Men of God. As a father of three boys, Pastor Mike Fabarez’s book was just what I needed. It’s a biblical call to be proactive in leading sons and training them to be men; in contrast to the non-parenting so prevalent in our day. A book I am trying to apply in my own family, and one I expect to buy extra copies of to give to other men I know need it. Omar Saif Ghobash. Letters to a Young Muslim. Ghobash, the UAE’s Ambassador to Russia, writes a series of letters to his young son on life, growing up, family, education, religion, and violence. 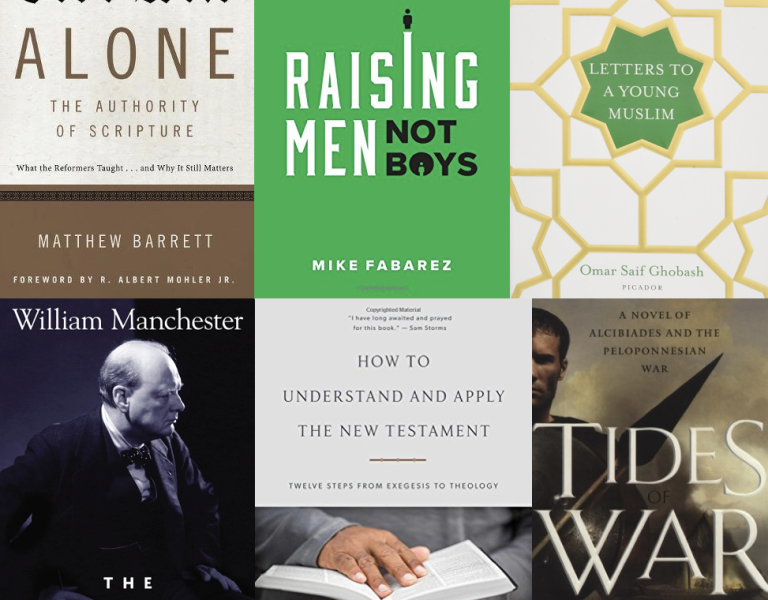 As a Christian, I disagree with many conclusions, yet am fascinated by the portrait of how one highly-educated cosmopolitan Arab leader is seeking to integrate his faith with the modern world, and to be a loving father to his son. If one’s only perspective on Islam comes from Fox News, Ghobash is going to show you something different, something that sounds more like what I see in most of my neighbors in this region. William Manchester. The Last Lion: Winston Spencer Churchill. Alone, 1932–1940. A good portion of my year was spent plowing through Manchester’s whole Churchill trilogy. The first two are marvelous, the final volume finished by Paul Rudd after Manchester’s death merely solid. But the middle tome was my favorite for how it handled this less-known, bleak portion of Churchill’s life and shows how it is was the foundation for all that came after. Andrew Naselli. How to Understand and Apply the New Testament. This is a “just right” introduction to NT Interpretation. Andy Naselli gives as much detail as most need, but accessible and readable enough for anyone. It has been a joy to go very thoroughly this book with our 2nd year exegesis students and they have all been helped by it. Steven Pressfield. Tides of War. Historical fiction surrounding Athens, Sparta, Alcibiades, and the Peloponnesian War. Makes you feel like you’re there in the midst of this history that lies in the background of the New Testament. A touch seedy (like the history it narrates), but hard to put down. Ron Chernow. Washington: A Life. I actually didn’t know much about Washington before. Now I do. Went out and bought Chernow’s other bios subsequently. Andy Crouch. Strong and Weak. A really interesting treatment of strength, vulnerability, and leadership; well worth discussing with a team. Timothy Keller. Making Sense of God: An Invitation to the Skeptical. One of Keller’s best. D. Q. McInerny. Being Logical: A Guide to Good Thinking. If everybody applied this book the world would be a better place. I make all my students read it anyway. John Piper. Reading the Bible Supernaturally: Seeing and Savoring the Glory of God in Scripture. All the typical Piper features, but a great argument for why we should dig into the Bible, with some guidance for how. James Stoddard. The High House. Read and discussed this trilogy with my 13-year old son. Fun stories/allegories, if a little inconsistent and weird. Stephen Wellum. God the Son Incarnate: The Doctrine of Christ. Steve Wellum writes a very thorough treatment of Christology, set in the biblical storyline, with a few unexpected nuggets. So that’s it! Happy reading! P.S. If I am your favorite bibliophile for whom you are seeking gift-giving ideas, try here.